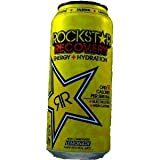 Rockstar Recovery Energy Drink is a hydration/energy drink hybrid from Rockstar Energy. It has the standard energy blend but added electrolytes, prickly pear cactus juice, and only 20 calories per can as compared with regular Rockstar. All flavors of Rockstar Recovery have the same caffeine content. See our full review of this energy drink here. How Does Rockstar Recovery Compare? Rockstar Recovery contains 10.00 mgs of caffeine per fluid ounce (33.81mg/100 ml).